Are you considering moving outside of the country and becoming an expat after you retire? You may be dreaming of new adventures, the excitement of living in and experiencing a new culture. Or maybe you are looking to find a place where you get more bang for your buck. Whatever your reason, the world awaits. It is a big world and making the decision as to where to land is difficult at best. You may decide to move to where every other expat is moving these days – the “latest” location touted by those expat retirement blogs – or you may do a personal search to find the location that works best for you. In my search for the “right” location I have found a few cities that would offer me much of what I look for. I fell in love with Antigua, Guatemala years and hoped to live there someday. 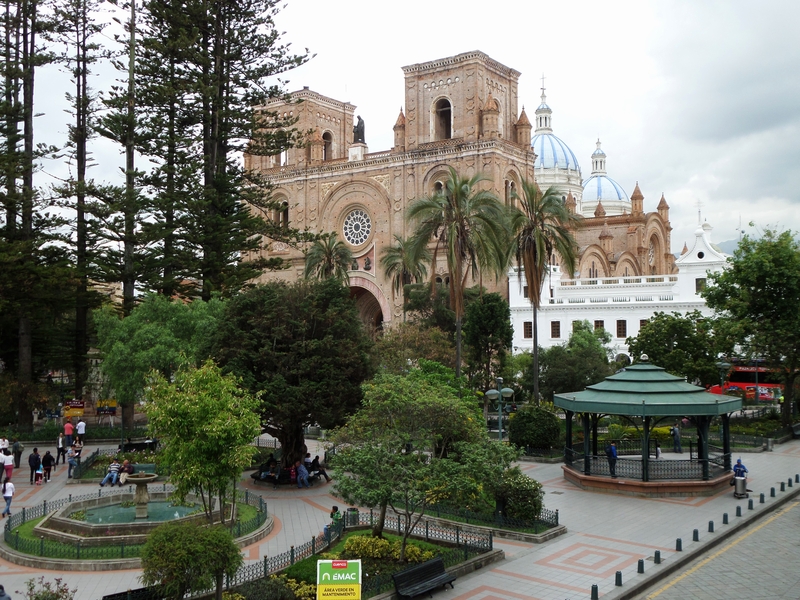 Then there is Cuenca, a beautiful, colonial city high in the Andes of Ecuador, that captured my heart as I wandered through el Centro on my very first visit. They are both viable options, but I am not yet convinced where I will hang my hat and I plan to continue my search… Guatemala, Chile, Spain, France, Sicily, Greece, Malaysia, Thailand…the list goes on and on. So many locations to consider! Dig deep and ask the tough questions. Why are you thinking about doing this? What is important to you? What do you need vs. what do you want? Can you be happy with only the needs being fulfilled? Are you willing to accept they way they do things in your new country or will you expect they do it the way to which you are accustomed? Can you live without that red licorice or your favorite barbeque sauce? Friends and family. How will you keep in touch? Will you be happy not seeing them in person on a weekly or monthly basis? Can you be such a long way from your grandkids? Is this a forever move or will you only be going for a few years and returning or moving on? All these questions and more need to honestly answered. A trip to explore your potential expat city will help to answer some of these questions. Digging deep and reflecting on your values, adaptability and flexibility will help clarify your reasons, expectations and likelihood of success. Blogs abound about moving to and living other countries. The bloggers share their experiences and offer a myriad of suggestions for you to chew on. Then there are sites like numbeo.com that provide costs and living expense comparisons, a very useful tool in seeing how far your resources will stretch. Facebook has many groups for expats living in different locations around the world. It’s a great place to interact with and ask questions of people who have already made their move. You will find those who have adapted well, some who are less than happy for numerous reasons, and still others who after a couple of years are heading back to their home country. These pages generally give a pretty balanced perspective on living in that city or country and honest answers abound to any question you may ask. Think about visas, residency requirement, and citizenship, if you are interested in going that route. Healthcare. What are the options? Is there a government program with an option to purchase private insurance instead? What will it cost out of pocket and would that be within your budget? Will you keep supplemental insurance for when you go back home to visit? Or will you just have travel insurance? Then there is your best bud. Are you able to bring your beloved pet? What are the requirements to make that happen? Are there vets available and what does their practice look like? What is the culture of pets in the community? Is the expat community active and welcoming? Starting by making some expat contacts and broadening your community to include the locals as well will only enhance your experience. A solid plan will take before, during and after the move into consideration. Long before ever packing your bags, make a plan. How will all the “at home” requirements be handled? Will everything be handled by electronic mail? Banking, credit cards, taxes, financial planning all need to be considered. How will those be handled? When will you move? Do you need to sell a home before you leave? Or will you rent it…just in case? What will your move look like? Will you only take a couple of suitcases and start fresh? Or will you pack up your entire household and all your belongings and arrange for them to be shipped? How will you stay in touch with family and friends? Will emails and Facebook suffice or will you want to have more personal contact through Skype? There is so much to consider and a written, detailed plan will only make things go so much smoother. The logistics related to the move need to be considered and fully understood. Stress mixed with excitement and anticipation will be high, so having all your ducks in a row before you hop on the plane will be critical to a smooth transition. Set a few routines when you arrive to get you out into the community so you can begin to make connections with expats and locals alike. Each morning after breakfast while living in Peru I would enjoy a leisurely cup off coffee in the house courtyard, and mid-morning I would stroll across town to the open air market to get exercise, enjoy the sights and sounds of the city and inevitably I would run into someone I was acquainted with. While living in Guatemala City I had a routine on the weekends. Having taught school all week, I liked to take the bus to a nearby town, Antiqua, for the day and occasionally overnight on the weekends. It became a favorite place to go to unwind, and I became familiar with the town and it with me. If a weekend getaway isn’t an option, consider a Saturday morning walk along the river, ending with coffee and pastry at that quiet little bakery on the other side of town. Or maybe you will join a group with like interests, volunteer to read to children at the local school or help out at an animal shelter. Setting a few routines at first to get out and about in a normal ‘I live in this town’ kind of way, not ‘I am here as a tourist’ kind of way can normalize your new life. It will provide you opportunity to meet people in those shops, restaurants, schools, clubs and overtime relationships will evolve and friendships will grow. For some this will be easy. For others who may be a little more introverted or reserved this may feel like a daunting task. Most cities where expats reside have welcome lunches or gatherings that are held weekly or monthly. Go to the expat hangouts to start the interaction. Get to know the locals in your neighborhood. Understand that some cultures, though very friendly, may not invite you to their home for a long time. I lived in Peru for two years and I never made it past the parlor in friends homes where guests were welcomed to visit. Walk softly, observe and learn. Local friendships will evolve naturally over time and more often than not, expats will welcome you with open arms. Moving to another country can be a real adventure. Having a well thought out plan and having fully considered your reasons for moving and expectations of the experience can make this new adventure fun and exciting. What have you done or what are you doing to make your expat move smooth and successful? It has been a while since I have written anything in this blog. I think writing is mostly inspired by our unresolved emotions, fears that haunt us in the quiet hours of the night, the stories of our past that create our now and future realities undefined. When I first started writing this blog, I started in a flurry. I was in a constant state of internal turmoil, circling my future life, the life that would be my retirement and, as a result, the words fell on the page in rapid fire. It was a time of questioning whether I would be able to live a good life when I retired. What would it look like and where would it be? I have to credit this blog and what could be called a public journaling experience to calm my soul and take me to a place of now. It’s good to be home again, in my mind, in my heart and in my soul. A number of readers of this blog have asked me over the past few months why I had stopped blogging. The truth is that I never really stopped. I simply paused. I paused because of one cappuccino in a small café. It was a few months ago that my blog postings paused. And, coincidentally, it was also a few months ago that I traveled to Cuenca, Ecuador, a city high in the Andes that has been touted as the number one place in the world for US retirees to relocate. I had been planning to travel there 6 months later with a friend, but those travel plans were moved up so that I could get a taste of my possibilities, sooner rather than later. I needed to know. I needed to quell my uncertainties, satiate my curiosity and affirm that one of the many options racing through my mind was viable. Waiting 6 months to find out if it was an option was not reasonable for me, unless I wanted to waste 6 months racked with unknowns. So, I hopped on a plane to find out if one of my potential retirement options was something that I could hold onto as an option or something that I needed to walk away from forever. It was during my eight days exploring Cuenca, Ecuador that a shift in consciousness took place and for the first time since the market crashed and the shell of my nest egg cracked, that I felt at peace. After wandering the city for several days, meeting welcoming expats and locals alike, I found a little dessert café off Parque Calderon, at the other end of the block from where the cathedral stands. 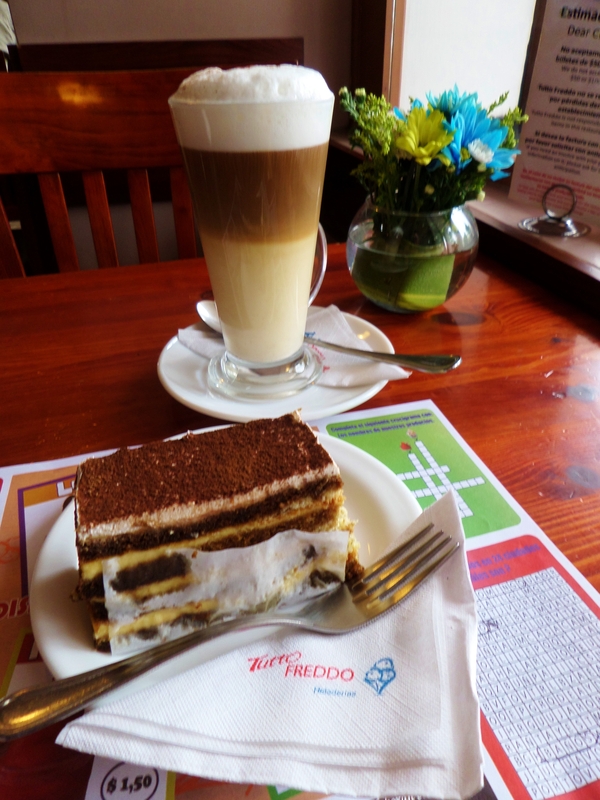 I settled in by the window to enjoy a tall Italian cappuccino and tiramisu. I sat with my thoughts and gazed out the window, watching life in Cuenca pass by. The cappuccino was tall, rich and beautifully layered. The tiramisu the best I had had. For the first time in a long time I felt at peace. I was present. I was in the moment. I was not searching for a solution to my future. I was living it. The cost of the cappuccino and tiramisu barely touched my wallet. I knew that I could afford to live here. I could be happy here. I liked the city. I liked the expats. I liked the culture and the locals. And, well, truth be told, I loved the tiramisu. Retirement would be just fine. It was in that moment, sipping on that cappuccino, that I realized that not only did I have one good retirement option, but I had a world of options. I recognized that retirement can be anything I want it to be. It can be nomadic, moving from country to country experiencing this wonderful, culturally diverse world. It can be on a beach or in the mountains in a far away land. It can be in a small RV traveling around the US or in a park model nuzzled in with a community of other retirees. My options are unlimited. I will be returning to Ecuador in the near future. There is so much more of that beautiful country that I would like to see, the smaller cities and villages, the hot springs, live volcanoes and waterfalls. Truth be told, my reasons for returning are mixed. I guess on some level I want more of that delicious cappuccino and tiramisu in that little café just across from the park…or maybe, just maybe, what I really want is another dose of the peace that came with it. Are you considering expat life as your retirement nears? Maybe you already are an expat who has moved to the country of your dreams? As I circle around all my options for retirement, I think about the allure of living the life of an expat. I have lived outside the country before, so I have realistic expectations of what expat life in my retirement years will look like and get very excited about that option. But then I think about my friends and family who would remain here, while I ventured on. Conflict. Torn between two loves. I suspect if I were one half of a couple that this decision would create less conflict, but I am not sure. Maybe it is even more difficult for a couple, because of the ties that each have. There is a pull between affordable adventure that will allow me to save money, travel home for visits while putting money away for long term security, or living downsized on a tight budget, with little to no disposable income, but the closeness of friends and family. When I lived in the Peruvian Amazon in my late 40’s, after an adjustment period of 6 months, I bought a very simple house outside of the city of Iquitos, in a joven community, a newly established community, near the little airport. Most of the houses in that community were made of slatted boards with dirt floors, but mine was created of cement blocks, a little more upscale than the majority of the others in that area. It had belonged to a local judge who was moving to Lima. There was no window glass or screens and it was protected above by a corrugated tin roof that sang loudly when it rained. I only paid a few thousand dollars for it, which I thought was reasonable, although local friends, on the other hand, repeatedly told me “You paid too much. You paid too much.” I was a “gringa” after all, so I expected that I would pay more than a local. I was fine with that. I liked having my own home and that’s what mattered. It was quite simple and required a dropdown ceiling be installed, only because rats racing across the cross beams while I slept was way outside my comfort zone. I did enjoy living there, even though the community was located 15 minutes outside of town and I would need to hop the chicken bus, take a mototaxi, or drive my 20 year old beater of a Volkswagen Bug that I called “Broken Down” to get into town. Broken Down was guaranteed to die daily, at least once, as I went to and from the city center. I found myself running back and forth to town throughout the day, and most evenings, and often Broken Down and I would end up waiting for my dear friend Waldermar to come and fix my car that seemed to prefer sitting on the side of the road rather than moving down it. In Guatemala, I lived in the city, in a hotel, not far from the center, that had been converted into small, but efficient apartments. Things were closer and buses were frequent, so reliable transportation was never an issue and I didn’t have a temperamental VW Bug to deal with. The hustle and bustle and energy of the city was palpable. I loved urban living. Eights years from now is my target retirement date, so I spend a lot of time considering what lifestyle would be best for me when retirement comes, as a single woman in my seventh decade of life and beyond. I am healthy and get around easily and anticipate that will continue, so neither health nor mobility impacts my decision. In this moment, I am leaning toward a secure apartment in a bohemian or artsy type neighborhood in a city, so that I can walk, have ease of access to transportation, easily visit the market, restaurants and entertainment. The idea of walking to the market, to my favorite coffee shop, arts and entertainment events, and an evening strolling along the river or malecon as the day comes to an end means a full life, daily exercise and continued health. Those are important considerations. I think I have decided that I will live in the city if I, ultimately, decide to live abroad. But the song “Torn Between Two Lovers” keeps coming to mind. Well, maybe not “lovers,” but loves. My love for adventure and foreign cultures tugs at me. It calls to me during my sleep and my waking hours. It never leaves me. It calls for me to come. Those calls and tugs trigger my senses to recall international living, the smells of traditional foods being cooked in open air storefronts, the scurry of activity in the market as vendors set up for their day’s work. I hear the chatter of a language that becomes more familiar everyday and cherish the experience of being in a different culture, in a foreign land. I love. On one side of the coin the love of a new life adventure calls, while on the other side of that same coin there is a whisper in my ear asking about the love of my family and friends, tugging at me to stay. I feel torn. When I was in my late 40’s and early 50’s, I would just make up my mind to move, sell off all my belongings, hop on a plane, and be in another culturing living the life I dreamed of. It was a blink of an eye decision. It seems funny to me now, that in just a decade’s time, the same decision that was made 10 years earlier isn’t as simple and clear cut as it was back then. If I stay in this country, then the question to be answered is equally complicated. Sell the house and then what? Will I still be around friends and family or will I move to a different state to live in a 55+ community or travel the country in an RV? I know these questions will be answered over time, but for now…my head spins around my two loves…life as an expat in a foreign land or life here with family and friends. Anyone can become a savings sleuth and cut, shave or slash their monthly expenses. All you need to do is look around, the savings are there. Are you interested in cutting your monthly expenses? Then put on your detective’s hat and do some super sleuthing. Searching for bargains can be really fun and satisfying when you know that you are going to cut costs and save some money. Together all those savings can really add up! Always be friendly to clerks in the checkout line and ask if there is an unadvertised discount available. Often there are discounts that they can give you on your purchase that you might not have known about or weren’t advertised. I have successfully done this on more than one occasion. A few months back, I was at a craft store buying an set of artist’s colored pencils in a nice metal box. Anything with the word “artist” on it is way overpriced, and as I stood at the register cringing at the price I was about to pay, I asked, “Any coupons or discounts today?” The young woman at the register said, “Well, there is a 50% off the first item. Do you have an smart phone?” In all my excitement, I struggled to find the coupon online. After some time, she tired of watching me, opened the drawer below the register, pulled out a barcoded paper and wha-lah, the discount was applied to purchase. I saved a lot of money that day with just a smile and a question! Depending on the amount of garbage you have every week, you may be able to get once a month service. I compost and recycle, and buy very little that is pre-packaged. The result is very little garbage. So, I called the waste management company and asked if they had less expensive options. I was pleasantly surprised to find that there were other service options, and I was able to reduce my collection service from weekly to once a month, saving a considerable amount on my monthly bill. Contact your water, sewage, electric and waste management companies to see what discounts they offer. Some utilities offer discounts based on age, income, or both. A friend of mine has reduced her city bill, for water and sewage, by a whopping 50%! You may also be able to pay reduced real estate taxes. Contact your county to find out what programs they have available. It may be as simple as filling out a form. There is something to be said for becoming a senior, discounts abound! Think about your phone, cable and internet services. New promotions for these services are constant. I switched to a phone service provider that doesn’t require a contract. It is a monthly prepay option and costs about half of what I was paying before. Now, included in my service, I have unlimited data and texting included in the price that I didn’t have before. So not only am I saving on the monthly service fee, but I am getting more bang for my buck! Being without a phone service contract allows you to shift to another provider easily, when a better deal avails itself. Plus, if you are a part-time expat you can stop your service while you are out of the country and start it up again when you return. Do your research before buying something online. After you find the best price and before you click to complete the sale, if there is a place to put a promotion code, use it. Often times, there is a discount for the item you are purchasing, or free shipping, if you put in a promo code. Search online. Put in the store name, promo code, month, and year in the search engine. There will a number of sites to choose from. You may find a code, or you may not, but it is worth the savings to take a moment and try. Going out to eat? Check the restaurant’s website before you go to see if there is a coupon, or call around and find restaurants that offer a senior discount or early bird special. If you don’t ask, you will never know. A friend and I go to a favorite Mexican restaurant in town and the first thing we do before heading to the restaurant is go to the computer and download the restaurant’s coupon. Second entrée free! Can’t beat that! Garage sales, thrift stores and community and church rummage sales are a perfect way to pick up something you really do need, at a great price. New items once purchased, become “used” once it comes through your door. Nothing is new forever. So, if you buy a gently used and in good condition item, then you are saving a lot of money compared to a new item that becomes “used” the first time you use it, sit on it, or wear it. When you are heading out the door, know exactly what you are looking for, otherwise you risk coming home with a carload of stuff that you don’t need and really don’t want. I like to keep a watchful eye for community garage sales in the higher end communities where you can find great bargains at a fraction of the cost. 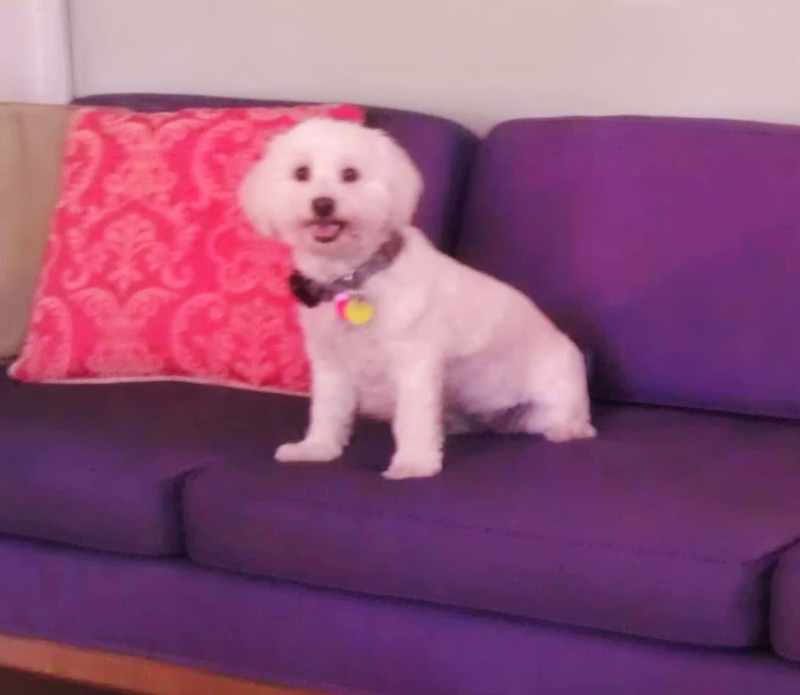 I found a great purple sofa – yes, purple – at a garage sale that was recently reupholstered. They even delivered it for me, brought it up the stairs and set it in place. My little dog, Maggie Mae, claimed it as her own immediately! How have you cut your monthly expenses? Share your thoughts below. One of the hardest things I have tried to do is define my retirement. What am I going to do? What will my life look like? If you are like me, and you are nearing retirement age, the unknown of what is to come can send your head a spinning. Will you live as you always have, just not heading to your job everyday? Or maybe you will work part-time doing something you love. Is downsizing in the future? Will you be moving to a smaller place to live? Maybe you plan to travel around the country or see world. Are you thinking about volunteering at your church, the local food bank or for an international non-profit? Maybe personal growth is a desire, taking a course or two online or at the local college or your preference is taking care of your wonderful grandchildren a few days a week. There are so many options. When it comes to defining retirement it will look different for everyone. The one thing I am allowing myself to do is change my mind daily. One day I am trying to figure out a way to stay in my house and continue living life as I have, without working, of course!. The next minute I visualize myself heading off to the Peace Corp or becoming an expat in a culture that calls out to me. Everyday day is an adventure in defining my retirement and I am finding joy in the exploration and creation. Visions of your retirement will change and evolve over time, until you find the one that will work for you, and then, who knows, maybe it will change again. This is your life and your time. Create a life that will make you happy. There is no right and no wrong. Look at all your options. Think outside of the box. Don’t be afraid to try something different. Remember that any decision that you make can be reversed. Nothing is set in stone. Retirement is your oyster. Open the shell and find your pearl. Comment below on how your define your upcoming retirement. But before you do, check out how the kids describe what retirement is, how much money you need, and how long it lasts.